The Care Bears are a group of multi coloured bear characters which were created by American Greetings Corporation in 1981 for use on greeting cards. In 1983 Kenner turned the Care Bears into plush soft toy teddy bears. Each Care Bear comes in a different colour and has a special symbol on its tummy that represents its duty and personality. These Care Bear characters appeared in TV specials, TV series and then movies over the years. The early Care Bears have become very collectible, and the soft toys are just as popular today as they were 30 years ago. This is a wonderful large book for children who love to read and sing. 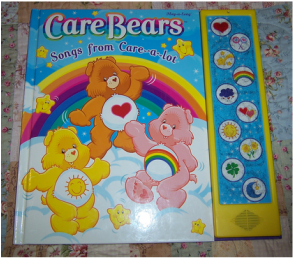 It is a picture book of Care Bears with different tummy symbols with the words of 10 different songs. On the side of the book are 10 different picture symbols which refer to a Care Bear inside the book. When you see the symbol in the book, you press the corresponding symbol on the side and the music of the song will start and you can sing a long with the written words. There are some repaired rips to the bottom of 3 pages. The side panel has some darkening on it but does not stop the music or even seeing the symbols. We have for sale two care bears. They are still being produced today and have been a favourite soft toy for children over the generations. Original Care Bear from what we believe to be circa 1980 and as such would be over 30 years old. She has her original cloth tag to her body but is hard to read. .her fur does look a little dirty as you would expect from a well loved toy, but could be soaked clean if desired but will leave that to new owner. This bear is newer and is clearly tagged 2009. He is lavender in colour but it is a different type of fur compared to the original Care Bear (not as plush).
. body also shows being well loved and could do with a soak as well. You can actually see the differences in how these bears have emerged over the years. 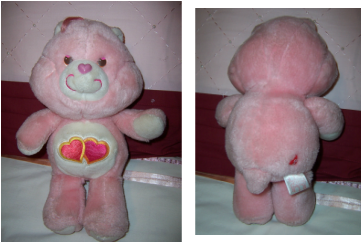 This cute Care Bear is an original rare hard to find 1983 ''Love a Lot'' soft toy. It has been made by Kenner for American Greetings in Taiwan. She is pink and white in colour with a mauve heart plastic nose. Her tummy badge is two intertwined embroidered hearts. Baby Hugs Bear (called Hugs) is a Care Bear cub and the twin sister of Baby Tugs Bear. She and her brother made her first cartoon appearance in the 1984 television special called ''The Care Bears Battle the Freeze Machine''. 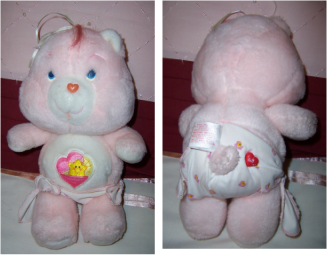 Hugs is pink in colour and is wearing a cloth nappy. A rare Care Bear item. Cheer Bear is one of the ten original Care Bear who were first introduced as a character on American Greeting cards in 1982. She has been a main character since then in all stories. 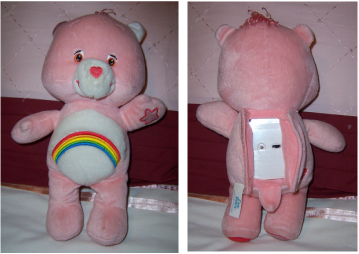 Cheer Bear can be identified by her pink fur and multicoloured rainbow on her stomach. Our Cheer Bear is a rare talking bear (batteries required) who plays the "follow me" game where you have to remember the instructions similar to the game "Simple Simon". The squeeze points are - bottom of foot, paw, nose and tummy. She is approx 32cm tall, is in good used condition, no batteries included, and has embroidered features. 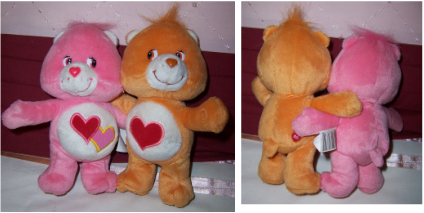 "LOVE A LOT & TENDERHEART"
We have for sale two care bears who are intertwined with arms around each other. Their free arms have vecro on them and so can can be attached to each other in a hugging pose.